Published: Saturday, May 5, 2012 at 6:01 a.m. 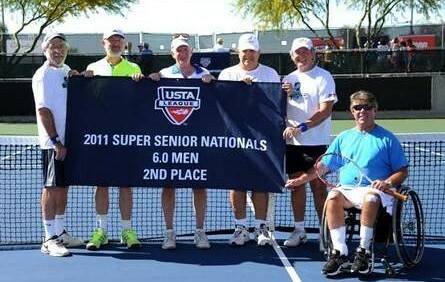 The men’s team from Gainesville, representing the USTA Florida Section, finished second at the USTA League 6.0 Super Senior National Championships held at the Surprise Tennis and Racquet Complex in Surprise, Ariz., last month. The Gainesville team lost to a team from San Juan, Puerto Rico, 3-0 in the championship match. Gainesville had defeated a team from Bluffton, S.C., 2-1 in the semifinals. They advanced by winning their round-robin flight. The team was captained by Patrick Phelan and features Alex Kesler, Russ Metler, William Lee Wiltbank, Albert Guarino, Malcolm Maden and John William Johnston and plays at the Jonesville Tennis Center. The top four teams in order of finish are: Caribbean Section, Florida Section, Pacific Northwest Section and Southern Section. This year’s USTA League 6.0 Super Senior National Championship drew the top 23 teams (eight men’s and 15 women’s) from throughout the nation. USTA League was established to provide adult recreational tennis players throughout the country with the opportunity to compete against players of similar ability levels.